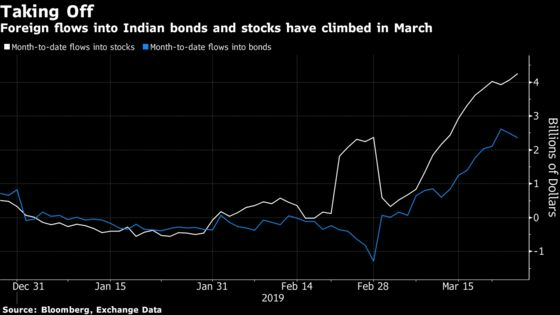 (Bloomberg) -- Indian markets have staged an eye-catching comeback in March after taking a drubbing in the first two months of the year, and bulls are salivating at the prospect of more gains. The RBI will lower the benchmark repurchase rate by 25 basis points to 6 percent on April 4, according to the median estimate in a Bloomberg News survey. The central bank’s dovish turn in February -- when it changed its policy stance to neutral from ‘calibrated tightening’ -- spurred the rally in bonds, with investors benefiting from India’s relatively high yields. The RBI’s open-market debt purchases added to the gains. The yield on India’s most-traded sovereign debt due January 2028 has fallen from this year’s high of 7.67 percent in February to 7.48 percent on Friday. That on notes maturing in April 2020 slipped 15 basis points in March to 6.42 percent.